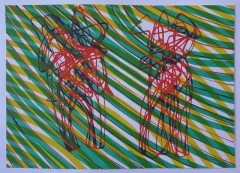 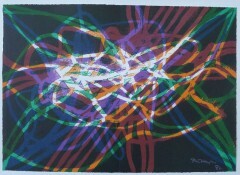 S.W.Hayter (Stanley William Hayter) came from an artistic background. 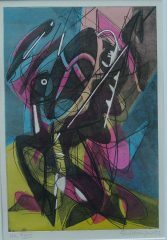 Although he trained as a chemist and geologist and worked for three years in the Middle East as a chemist-geologist for the Anglo-Iranian Oil Company in 1926, he moved to Paris to study art. 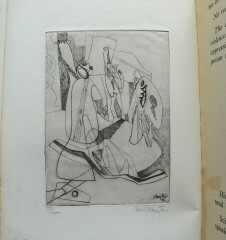 By 1927 he had set up his studio as a printmaking workshop, which later developed into the famous Atelier 17. 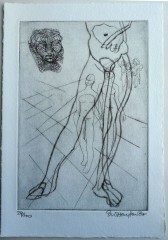 Joseph Hecht, an engraver friend in Paris, influenced Hayter in the choice of engraving as his medium. 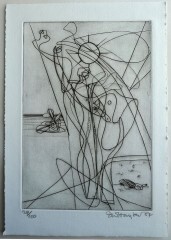 As he turned towards Surrealism from 1929 onwards, Hayter combined engraving with an automatic drawing technique parallel to automatic writing in Surrealism. 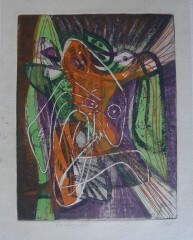 His Atelier 17 attracted many of the leading avant-garde artists such as Picasso, Kandinsky, Miro, Ernst among others. 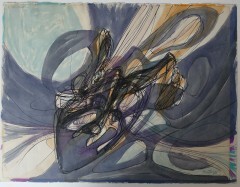 With the outbreak of the war he was forced to close the Atelier 17, and after spending a brief time in London in 1939 where he engaged in camouflage work for the army, Hayter moved to New York in 1940. 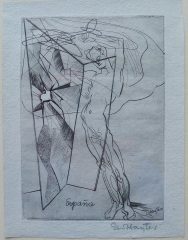 Here his re-opened studio which attracted other European émigré artists like Chagall, Lipchitz, Ernst, Matta and Breton, who had fled to New York. 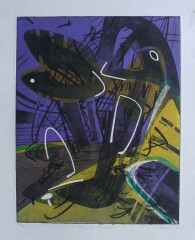 In 1945 Hayter established the New York Atellier 17. 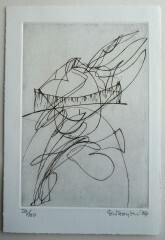 Among the Americans who worked in New York at the Atelier were Jackson Pollock, Motherwell, Calder, de Kooning and Rothko, before it closed in 1955. 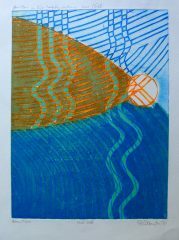 It was in New York that he invented a new printmaking process adapted to colour printing, described in his book ‘New Ways of Gravure’, 1949. 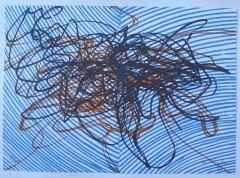 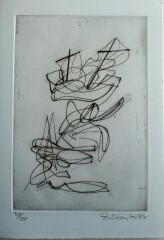 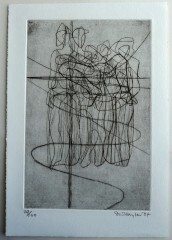 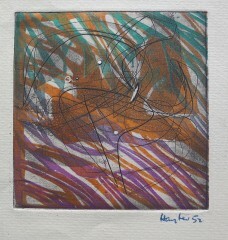 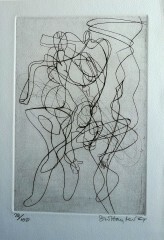 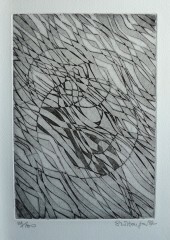 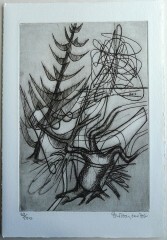 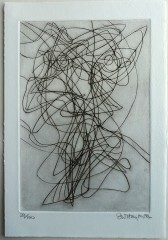 Stanley William Hayter etching as a greeting card.